Proms traditionally have been a night of glamour and romance, complete with backstage drama over dates and dresses. But prom culture is changing. Some teens now see prom as an opportunity to be inclusive rather than exclusive. They're using proms as vehicles for good deeds. And to take a stand on issues that matter to them. "Change can look like a prom dress," said Matthew McRae. He is a spokesman for the Canadian Museum for Human Rights in Winnipeg. "We thought it was a great example of someone making a change at the community level." Prom can be "a platform for social change," said April Masini. She writes the AskApril.com advice column. While some teens see prom as a night of playing grown-up by dressing in fancy clothes, for others, "their idea of being an adult is standing up for what they believe in." Michael is a New York Jets fan. 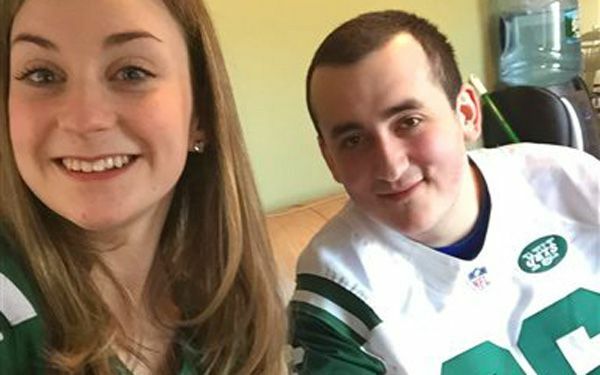 So Sarah messaged Jets players via Instagram and asked for help making a video prom invitation. To her surprise, Antonio Cromartie and eight other Jets sent videos of themselves saying, "Mike, will you go to the prom with Sarah?" She stitched the videos together and it was shown one morning in school with the day's announcements. "He's such a great kid. I didn't want him to go alone," said Sarah. "He had already been turned down so many times, I wanted to make it special for him." "Proms are a very traditional part of the high school experience," said Asaf Orr, staff attorney at the National Center for Lesbian Rights. The organization supported her case. "Participating in those events as your whole self, that's really what it's about. These kids are saying, 'I want to go to this event. I'm not going to hide part of who I am.'" I think that it is wonderful that girls are spending their prom night not worrying about what other people think and spending time to help a kid with special needs. I really enjoyed reading this article, it made me really happy seeing that those kids out there with special needs are getting the same experience as the rest. I think it's so sweet that people are taking students with disabilities to prom. I also really like the idea of being who you are at prom if that's wearing a dress or wearing a tuexdo it doesn't matter. I think this is a good change. I think that people look at other students that have disabilities a different way then I look at everyone else even though they are the same . I really hope by the time that I go to prom things have changed to be more like the proms in the story. I think it's really sweet how they all took special needs kids to prom. Prom is one of the most important events in highschool for most teenagers and instead of going with their boyfriend or someone they like they took people who would never get a date on their own. I think that was beautiful. I think that it's very heartwarming that high school students are taking special needs people to prom. Prom is something that most teens look forward to, and it's absolutely amazing that teens are taking people who don't fit in to prom instead of their boyfriend or girlfriend. I love when people are kind to those who are different because I have a special needs friend who wasn't treated like an equal until my group of friends accepted her as our own. After reading this article, I can't wait to go to prom so I can make someone's night amazing like these special students did. I think this is really sweet and generous. I can't believe how sweet the kids are to be asking kids in special ed to prom! I'm so happy people are taking a stand for not only special ed but people with other needs as well. I think Matthew McRae meant that anyone can make change in any type of setting, including the prom. I am excited to see young people making a difference and trying to change their world to be more like the world they want to see. Prom, what most people know as night for glam and to win prom king or queen, is changing. Teenagers are now using prom as a chance to include others and hang out with people out of their comfort zone. Kids are asking kids with special needs and making it a chance for them to feel normal and as if they are just like everybody else in high school. I really enjoyed reading this article because I think that this is a change for the good and I like to see everyone being included in the "normal" high school experience. The average, stereotypical teenager would hear that the prom was coming around and would immediately worry about what to wear and whom to go with. But this is a new generation filled with people who know what prom really means: having fun while being who you are. For example, two girls brought their friends with autism; not so they could be pitied, but so that the boys in both situations could have fun as regular people. In another instance, a lesbian wanted to wear a tux instead of a dress. Along with the help of the National Center for Lesbian Rights, she was able to convince the principal to change the dress code, which required females to wear dresses. Also, a girl in Rochelle, Georgia, along with some other teens, was able to organize a racially integrated prom. Previous proms had been racially segregated in the area. I am always proud to read about kids my age or only a bit older making such a difference in society. I myself believe everyone should be treated equally and should be able to do what he or she wants as long as it does not result in harm to others. This article is about two people who will be attending prom together in new york. 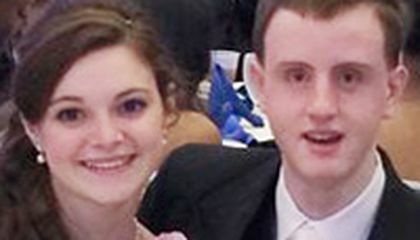 Sarah Kardonsky asked a special needs teenager, Michael Pagano, to go to prom with her. Overwhelmed, he obviously said yes. I think it is wonderful that students are starting to care less and less about what others think of them and more about what they can do to make someone else's day a little better. It nice to see people using prom as a way to show who they are and to preform good deeds. Its great to see people making a difference, usually the only thing you hear about prom and other dances is that they tend to have some sort of unnecessary drama or problems. but this is completely different.